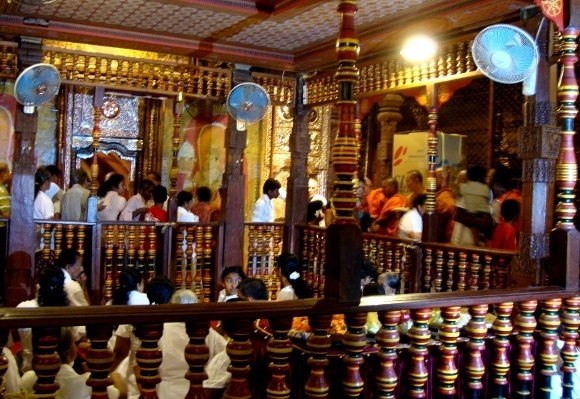 Tour Sri Lanka in the month of August for a spectacular, sacred celebration. Experience the vibrant event of Kandy Perahera, the festival of Buddha’s tooth. Deemed one of the world’s best festivals, Sri Lanka’s hill capital, Kandy, will be lit up in all its glory with an exuberant and magnificent street procession that has barely changed in centuries. The famous parade marks the public display of a replica of the famous tooth relic of Buddha that dates back to 310 AD. Concealed within a gold casket, the tooth is the most prized procession of Sri Lanka. Legend has it that the tooth was snatched from the Buddha’s funeral pyre and smuggled into Sri Lanka in the trusses of a princess. The acclaimed tooth became the private property of King Rajasinghe, who decided to allow his people to worship it during key celebrations. Due to numerous invasions, the location of the tooth has moved across various regions of Sri Lanka to Anuradhapura, Polonnaruwa and Dambedeniya. In the 16th century, it settled in Kandy and still to this day is housed in the renowned golden temple, Sri Dalada Maligawa. Watching the many pilgrims make their sacred lotus flowers offerings and daily puja (prayers) is a must for any guest in Sri Lanka. When the British Empire ruled Sri Lanka in the 18th century, the venerated tooth relic was handed over to the Buddhist clergy. This festival is also fused with the Esala Perahera, a full moon ritual whereby devotees worship the gods by cutting a jack tree and make offerings at the shrines of four Buddhists gods, thanking them for the much-needed rains for cultivating their crops. For a period during the British rule, there was no public celebration and a drought threatened Sri Lanka’s livelihood. After requests from Buddhist monks, the British decided to allow the celebrations, on the basis that only a replica of the tooth could be used, which remains the same today. Prior to the start of the procession, the streets of Kandy are sprinkled with purified water, torches burning coconut husks are lit and ancient cannons boom throughout the hill capital. Boys cracking whips signify the start of the festival, followed by acrobatic dancers tossing and twirling fire wheels and batons in the air. Atmosphere builds as performers in colorful silk costume parade the streets. Many traditional dances that have been passed down generations spin into life, including cane dancing, Kohomba Kale (or pot dancing), fire walking and the Kayadi, a dance of the peacock. Traditional flutes chime the night sky whilst drummers play explosive beats, deftly spinning them in the air with incredible precision. Ornately decorated elephants stride in a stately manner as they carry precious gems and gold. Finally, spectators rise to their feet as the golden casket finally follows, carried by the Maligawe Tusker, a grand, long white tusked elephant. Plan your tour of Sri Lanka around Kandy Perahera, which takes place on 17 August 2016.